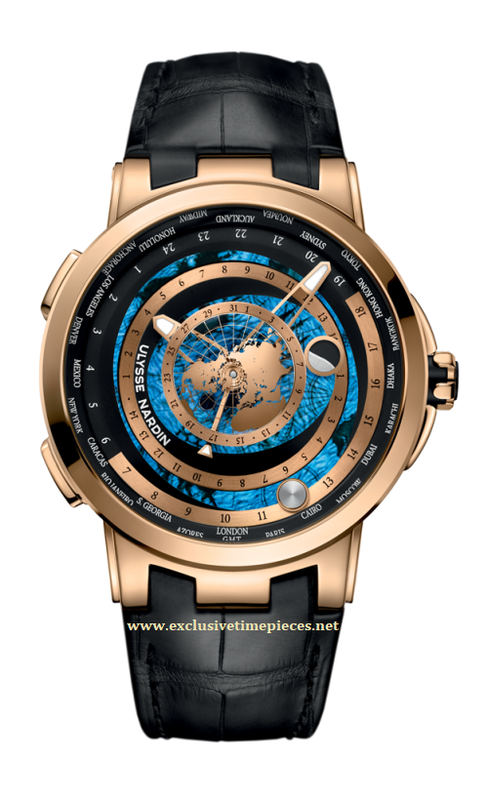 Ulysse Nardin Executive Moonstruck Worltime Limited Edition 100 Pieces. Sporty & Elegant. A spectacular Worldtime like no other in the world! This timepiece is a 24 city Worldtime, in addition it shows the orbit of the moon and the movement of the sun around the globe,it also shows the phases of the moon, date and indication of the tides. It is a beautiful 46mm, rose gold case, with date indicator, and has a 50 hour power reserve automatic movement. It features a glass exhibition back and is available on elegant crocodile leather strap with rose gold folding buckle.